Le célèbre puzzle de Compile, où le but est de créer des réactions en chaînes en empilant des puyos. Il est toujours intéressant de garder ce jeu quelque part chez soi. On le ressort avec toujours autant de plaisir. Très facile à trouver et à petit prix de surcroît, ce jeu est un must have. Dr. Robotnik's Mean Bean Machine est la version occidentale de ce titre. Donggeuri Toechijakjeon (Puyo Puyo)	Contribute! Two versions of this game were released in South Korea by Samsung. This one, is the most curious one. 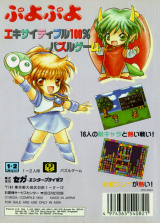 It was basically a Japanese SEGA Puyo Puyo cartridge covered with a Dr. Robotnik's Mean Bean Machine label (see photos). 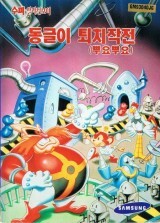 The 2nd version was a Samsung cartridge containing the game Dr. Robotnik's Mean Bean Machine. 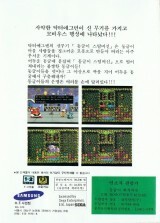 In other words, South Korea had both Puyo Puyo & Dr. Robotnik's Mean Bean Machine. Both release shared the same Dr. Robotnik's Mean Bean Machine design. On the title screen, press , , , , , , , and , you will hear a sound when the code is entered correctly. Sound Test is located on the Options menu.